Dryas integrifolia; Dryas octopetala – This floral emblem for the Northwest Territories was important for the Inuit — the untwisting of the white dryad or mountain avens seed head marked the best time to move inland to hunt caribou. The two dryad species look almost identical, and either one is suitable for Plantwatch observation. Both are found in arctic and alpine areas and, occasionally, below the treeline. 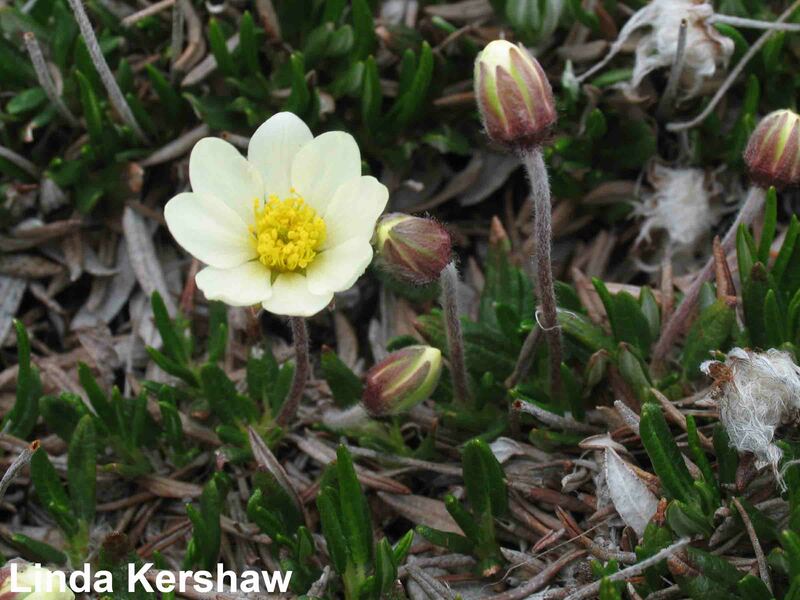 In the far north, a cushion shape is the more common growth form, but farther south these two ground-hugging species grow in dense, low mats that become a mass of white when the flowers appear. The leaves of both species are leathery and woolly on the underside, and stay green over winter. The flowers are saucer-shaped, 2.5 cm (1 in.) wide, with seven to ten creamy-white petals 8 mm – 15 mm (1/3 – 3/5 in.) long. The flowers grow above the foliage on stalks up to 15 cm (6 in.) high. After flowering, the styles (part of the carpel or female part, with the maturing seed at the base) become long and feathery, forming seed heads. These seed heads are distinctive: when they are immature or damp, the styles are all twisted together, but as they mature and dry, they unravel and are soon scattered about by the wind like dandelion or prairie crocus seeds. The two dryad species can be told apart by their leaves. In arctic dryad, the leaves are long and narrow, with smooth edges. They are also smooth and somewhat shiny on top, densely hairy beneath, and only 1 cm to 2 cm (2/5 – 4/5 in.) long. 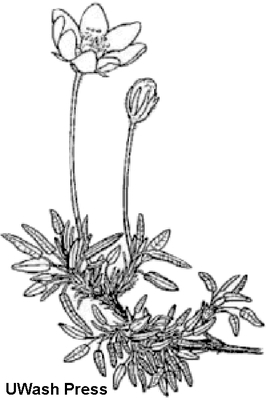 In alpine dryad, the leaves are larger, up to 3.5 cm (1 2/5 in.) long, wider and a little rounder. They have scalloped edges, and the upper leaf surface is wrinkled and glandular. The surface is often sticky from chemicals secreted by the glands of the leaf. The veins on the under-surface of the leaf are prominent with many tan-coloured spots (the glands). Both dryad species occur in the western mountains of Alberta. 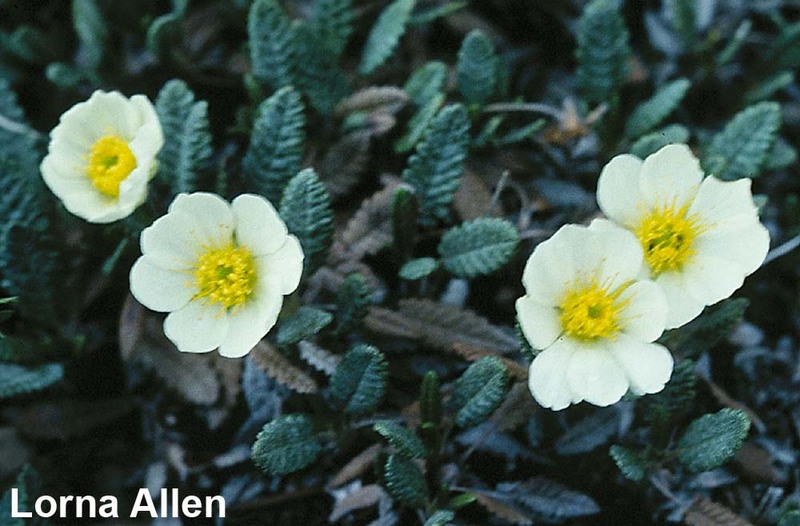 Both of these sun-loving species occur in gravelly and rocky barrens, on alpine meadows and ridges. They often occur on dry sites; however, Arctic dryad can tolerate moister conditions, where it becomes a creeping form. Less commonly, the two species inhabit unstable, low-elevation habitats such as gravelly riverbanks in mountain valleys. Find plants growing on a level surface, if possible. If the plants are growing on a slope, then use a compass to note which direction the slope is facing. Record the location on a data form, and submit the information when the flowering dates are sent. We recommend that plants be marked so that they can be located throughout the season and in following years. One simple way to mark the plants is to use a few of the rocks found in the area. A more permanent (and complicated) way is used by Arctic researchers: “Use soft steel or iron wire, about 1 mm [1/32 in.] diameter, 20 cm – 30 cm [8 - 12 in.] long. Form it into a U-shape, penetrate the soil with one end, some 5 cm [2 in.] from the plant centre, and push down until it surfaces, encircling parts of the root system. Attach a soft aluminum embossable metal tag, and twist together the ends of the wire.” (page 24, ITEX manual, 1996). If the site is regularly visited by other people, put up information signs, or hide the tags. White dryad can form a continuous carpet, making it hard to distinguish individual plants. If this problem occurs at the selected site, mark off a square metre of the plant. For corner marks, use rocks, or if something more permanent is desired, use aluminum or stiff, plastic pipe (15 mm [3/5 in.] diameter, white, plastic tubing, used for cables, works well). Stick the tubing into the ground to a depth of about 30 cm (12 in.) with about 3 cm (1 in.) visible above ground. A numbered label (aluminum lasts best) can be attached to one of the corner marks by drilling a hole through the top end of the tubing. Make a detailed map of the site. If the map is reasonably accurate the tags do not need to be very conspicuous. It would be helpful to know which species you are observing. This can be added under “Comments” on your data form. Use the leaf shape (see sketches) to distinguish arctic dryad (Dryas integrifolia), with its smooth leaf edges, from alpine dryad (Dryas ocotpetala), which has wavy leaf edges. First bloom: when the first flowers are open in the observed plants. Mid bloom: when 50% of the flowers are open in the observed plants. These plants have evolved to withstand the severe environmental and climatic conditions of their habitats. Their habit of growing very low on short stems helps to protect them against abrasion (sand-blasting) and drying in the wind. (Wind speed is much lower near the ground.) The woolliness of the leaves, and the way the leaves curl, both conserve moisture. As an adaptation to the short growing season, the leaves stay green over the winter, ready to do the job of photosynthesis in early spring before new leaves have developed. The saucer shape of the flower is also important. Like a miniature satellite dish, the flower focuses the rays of the sun towards the centre where the ovaries are developing seeds, and turns to track the sun through the sky. This parabola effect works so well that insects bask in the concentrated warmth generated in the centre of the flower. White dryad flowers usually contain male and female parts (they are hermaphroditic). Occasionally, variations occur: Some populations of alpine dryad in Europe have female and hermaphroditic flowers separate on different individuals. Arctic dryad plants sometimes have male flowers mixed in with hermaphroditic flowers on an individual plant. Cross-pollination (movement of pollen from a stamen of one flower to the stigma of another flower) is assisted by flies. Self-pollination can also occur but when it does, the seeds tend to be smaller than those that result from cross-pollination. Dryads can also spread by rooting of low shoots (vegetative reproduction). A large patch (about half a square metre [1 1/2 ft.2) of white dryad in the lower arctic may contain genetically identical individuals (a clone), several hundred years old. Dryad seeds are transported by the wind, the feathery styles serving as “wings”. White dryad often is the first plant species to grow on gravelly habitats, such as loose rock slopes in alpine areas, gravelly river bars or frost-heaved areas in the arctic. The plant stabilizes the recently disturbed ground, anchoring it with long tap roots. It grows on any soil but seems to prefer soils rich in calcium. Bacterial swellings or nodules are often found on the roots of white dryad. The bacteria take nitrogen from air in the soil and make it available to the roots. This ability is important in habitats where lack of soil nitrogen often restricts plant growth. 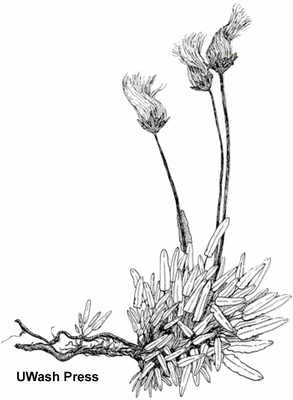 The white dryad’s only plant neighbours are other species that can withstand rock desert conditions, such as moss campion (Silene acaulis), various saxifrages, and rock jasmine (Androsace chamaejasme). All these plants are low-growing. Dryads are frequently found alongside tiny arctic willows (Salix reticulata and Salix arctica). 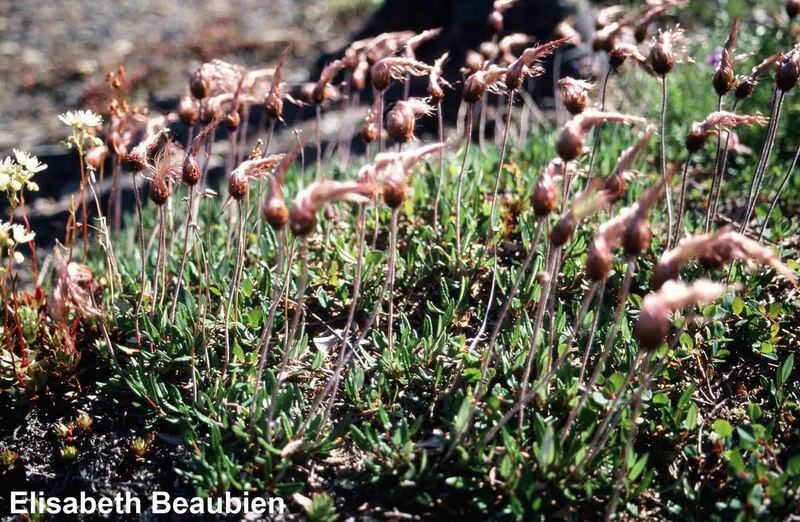 This plant is one of several species being studied as part of the International Tundra Experiment (ITEX), in which the impact of climate change on the growth, phenology and reproductive success of arctic plants is being examined. The greatest change in climate is predicted for high latitude or arctic areas. Work with white dryad has shown that experimentally increasing the temperature sped up all stages of flowering. Experiments on the response of alpine dryad to various heating, watering and fertilizer treatments have been done in Norway and Ellesmere Island. Arctic dryad is the floral emblem of Canada’s Northwest Territories. “Dryas” was the name for a wood nymph in Greek mythology; however, these species are not forest-dwellers! The flowers and seed plumes of white dryads produce a green dye. Inuit used arctic dryad as a “time-keeper”. From each side of the Mountain Aven grows a long hair, which starts life twisted upon itself and then slowly staightens out. Like the Purple Saxifrage, it too served people as a time-keeper. When the hair began to untwist, it meant fall was on the horizon. It also marked the time that caribou hides had reached their prime for making wintertime amauti for the women, signalling a need to move inland and hunt caribou. Dryads are attractive as garden plants because of the neat, trim leaves, abundant and long-lasting flowers, and interesting seed heads. Several different commercial varieties are available. Please do not attempt to move plants from the wild, which would be destructive to the plant’s natural habitat. Adult plants are hard to transplant anyway, because of their large branching taproot system. Although plants grown from seed take many years to flower, this method is still the best. If you want to grow white dryad in your garden you must try to copy its natural habitat as closely as possible. For example, planting it in a well-drained rock garden, where it is protected from hot afternoon sun and competition from other plants will likely bring success. “The most successful plant in stabilizing scree slopes and soil building is alpine dryad, named after the mythical tree-nymph supposedly because of the resemblance of its foliage to that of some species of oak. Its thick evergreen leaves have leaf pores protected under a felt of shaggy hairs on the lower leaf surface, enabling it to survive in these surface-heated gravels and wind-burred slopes. A.H. Zwinger and B.E. Willard. 1972. Land Above the Trees: A Guide to American Alpine Tundra. Harper & Row, New York. Clark, L.J. 1976. Wild flowers of the Pacific Northwest. Gray’s Publishing Ltd. Sidney, British Columbia. Gerling, H.S., M.G. Willoughby, A. Schoepf, C. Tannas, and K. Tannas. 1996. A guide to using native plants on disturbed lands. Alberta Agriculture, Food and Rural Development and Alberta Environmental Protection, Edmonton, Alberta. Hocking, B. 1968. Insect-flower associations in the High Arctic, with special reference to nectar.Oikos 19:359-388. MacKinnon, A.J. Pojar, and R. Coupé. 1992. Plants of northern British Columbia. Lone Pine Publishing, Edmonton, Alberta. Molau, U., and P. Mølgaard, eds. 1996. International Tundra Experiment ITEX Manual. 2d ed. Danish Polar Centre, Copenhagen, Denmark. Porsild, A.E. 1964. Illustrated flora of the Canadian Arctic Archipelago. National Museum of Canada Bulletin 146, National Museum of Canada, Ottawa, Ontario. ________. 1974. Rocky Mountain wildflowers. National Museum of Canada, Ottawa, Ontario. Porsild, A.E., and W.J. Cody.1980. Vascular plants of the Continental Northwest Territories, Canada. National Museum of Canada, Ottawa, Ontario. Savile, D.B.O. 1972. Arctic adaptations in plants. Canada Department of Agriculture Research Branch Monograph No. 6. Ottawa, Ontario. Sherk, L.C. 1988. Growing Canada’s floral emblems. The Canadian Wildflower Society, Toronto, Ontario. A.H. Zwinger and B.E. Willard. 1972. Land Above the Trees: A Guide to American Alpine Tundra. Harper & Row, New York. Harper & Row. New York. Thanks to Greg Henry, Ulf Molau, Josef Svoboda and Jeff Welker for contributions and editing.